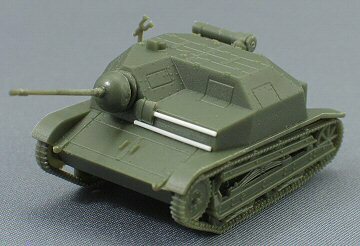 This kit has been designed as a quick build of a small tankette (I know tankette already means "little tank", but the TKS is really, really small ?). This means things are sometimes simplified, like major subassemblies being cast in one piece. This results in an extreme low number of parts : there is only one sprue (which is, strange enough, labelled B; where has sprue A gone?) containing no more than 12 parts. However, these are nicely moulded with sharp definition. This may be a quick build, but it is no short run kit. No decals or figures are provided. The box also contains a small, unpractical looking, plastic tube of smelly glue (with I didn't use). However, the plastic reacted quite well to my normal glue (Tamiya Extra Thin Cement). The instruction sheet is the back side of the box (left). 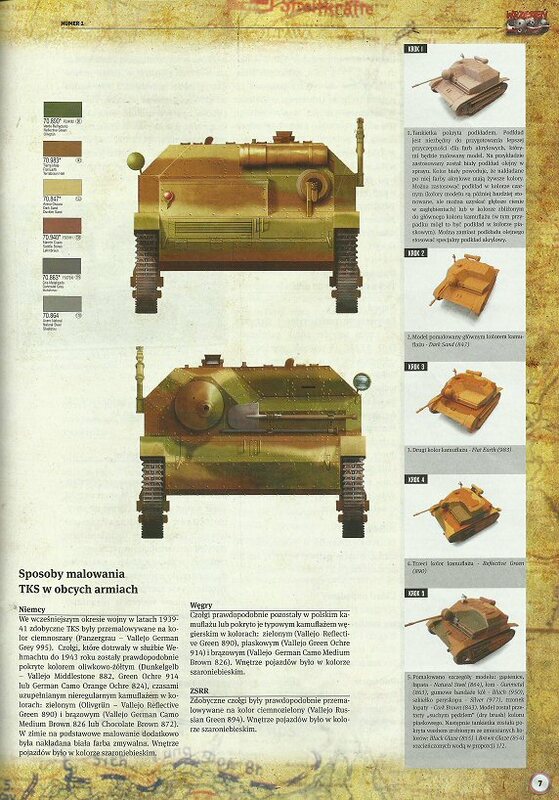 Here you'll find a painting scheme with the appropriate Vallejo paint proposed (however, no marking are depicted) and the assembly instructions. This is one small drawing in the standard exploded-view style with no written instructions; however, it is sufficient for this build. You also get a 12 page magazine, with some small B&W pictures and an enlargement of the same painting scheme found on the box (see below). 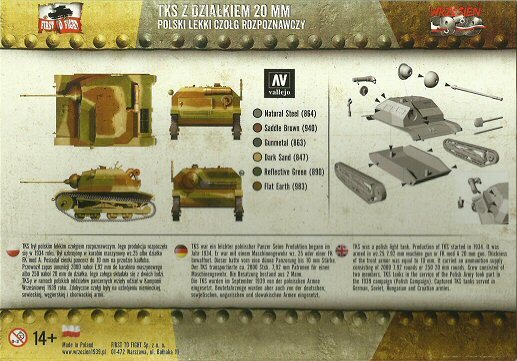 The text however is exclusively in Polish, which is a pity. The hull consists of two parts which, once assembled, gives a convincing representation of its complicated shape. They fit together very well; no gaps are visible between them so filling was not needed. I checked the dimensions of the assembled model against those mentioned on this site http://derela.pl/tk_con.htm and they turned out correct. 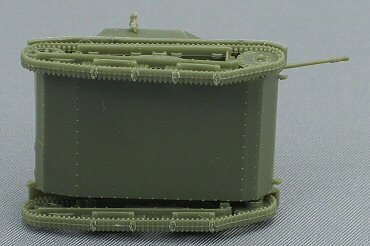 The upper fuselage has some very nice detail, like hinges, rivets and the commander's optic, on top of it. The vertical sides however, are devoid of these details, probably because of mould limitations. In reality, these sides are also bursting with rivets, adding them will be a real challenge. All hatches are moulded close and the driver's visor is not represented. 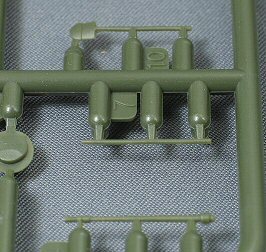 Both pair of handles on the glacis and engine compartment are cast solid; this problem can easily be corrected with some wire. 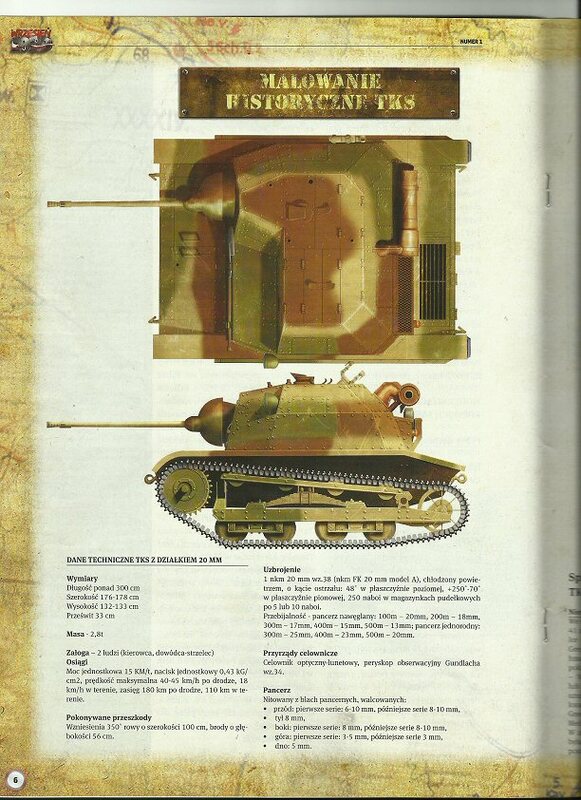 It struck me that, in contrast to the very fine detailed upper hull, other parts like the AA mount, the exhaust and the reserve roadwheel have much softer detail. Although visible on the box art, both the headlight and the rear light are not included on the sprue. 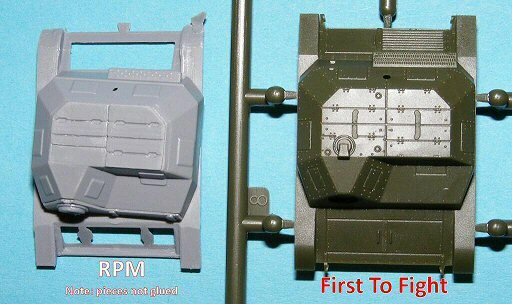 On the picture left, you see a comparison between the First to Fight hull and the RPM one (courtesy of Jeff Hamblen). Clearly the FtF upper hull has more and sharper detail. The plastic seems to be softer and more flexible than usual, which makes it more resistant to abrasive action. In most cases, this is not a problem. However, the choice of plastic made it nearly impossible to clean up those extreme fine and long parts (like the barrel, the shovel and the crowbar) which are very fragile. I don't consider myself being an inexperienced modeller, yet I was unable to remove completely those three big attachments points on them without breaking the shovel and the crowbar, even after backing them up against a steal ruler for extra strength and protection! In the end, I had to replace the broken parts with some styrene rod; the detailed barrel luckily survived the cleaning procedure. The number of attachments points has bedevilled me also in another area. The two suspension parts (tracks and wheels are moulded together) has 10 big ones to clean up. Additionally, these are all situated on the outer side of each track, meaning removing them is made more difficult because it will have to be done between the tread pattern. Another problem here is the prominent seam line running all along the tracks. I didn't remove these on my model to prove my case (see below). At first glance, the suspension looks very nice, with some beautiful detail. However, these being moulded in one piece has resulted in a number of simplifications : road wheels and return rollers are cast solid in their bogies, while the two guides on the inside of the each track link are depicted as one solid guide. This is a policy S-Model, the main producer of quick build kits, has also adapted, but which displeases several modellers. 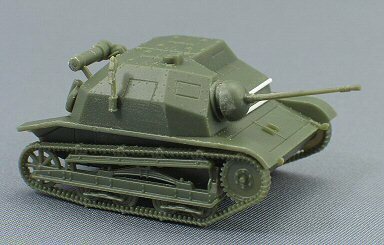 Somebody wishing to correct these shortcomings will be forced to scratchbuilt the whole assembly. However, Part has a PE update set designed for the RPM kit containing wheels and tracks, which could prove helpful for this FtF TKS too. This kit builds up to an acceptable representation of the TKS. It's nicely detailed in some areas, but a disappointment in some others. However, correcting its flaw will require a lot of fiddly work. 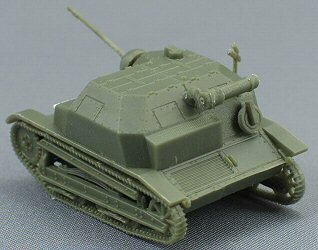 Although this kit is a quick build, is it, without adaptations, not a wargame kit. The extreme fine barrel is much too fragile; it wouldn't survive the first encounter with some thick fingers or a piece of terrain.